Design a 2-dimensional model of the interactions of water molecules and ions during the dissolving process. Read more about this activity, and the related activity, Advanced Modeling of the Dissolving Phenomenon, in the associated article, Using Learning Progression to Improve Scientific Modeling in Chemistry in the May 2018 issue of Chemistry Solutions. The student cut-outs for this activity are available as a separate file download. Engage: Engage your students by asking them to describe what happens when salt dissolves in water. Provide them with an image of salt and water and ask them to think about how the structure of each might be part of the dissolving process. 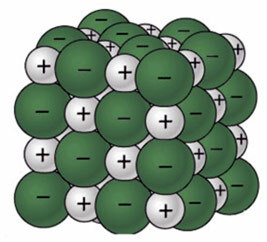 Explore: You students will then explore the dissolving process by building a two-dimensional model of a salt lattice with cut-outs of sodium and chloride ions. Ask them to explain what is holding the solid structure together. Explain: Use the image below to show your student what happen during the dissolving process. Ask them to describe the interaction between the charged ions and the water molecules. Then ask them to move their cut-out ions and molecules to demonstrate the dissolving process. Elaborate: Using the image below, have students discuss the difference in structure between water and isopropyl alcohol molecules. Have them make a prediction based on the following question, “Thinking about the polarity of water molecules and alcohol molecules, do you think alcohol would be just as good, better or worse than water at dissolving salt?” Their prediction must include information about their original dissolving model, polarity, interparticle forces, and structure. Evaluate: Students design an experimental procedure to test their predictions. Each group should record their procedures and get them approved before conducting their experiment. Based on their observations, have them answer the following question, “Is alcohol just as good, better, or worse than water at dissolving salt?” They should fully explain their answer using their observations and the model of dissolving that they developed at the beginning of the lesson. Before starting the activity, think about what might happen during the dissolving process. Look at the image of a sodium chloride crystal. What is it about water molecules and ions in salt that might make water able to dissolve salt? Question: What is holding the crystal together? Cut out the ions and water molecules. Arrange the sodium and chloride ions to represent a 2-D model of a salt crystal. What do you think is holding the crystal together? Question: What interaction occurs between the charged ions and the water molecule? The image below shows what happens during the dissolving process. Move your cut-out ions and molecules to demonstrate the dissolving process. Draw a model of the process of dissolving table salt in water below. Include at least one sodium and one chloride ion and several water molecules. Question: Is water or isopropyl alcohol better at dissolving salt? Make a prediction based on the following question, “Thinking about the polarity of water molecules and alcohol molecules, do you think alcohol would be just as good, better or worse than water at dissolving salt?” Your prediction must include information about polarity, interparticle forces, structure, and your original model of dissolving. Use the image below as reference (isopropyl on the left, water on the right). Question: Is alcohol just as good, better, or worse than water at dissolving salt? Based on your observations, answer the following question, “Is alcohol just as good, better, or worse than water at dissolving salt?”Fully explain your answer using your observations and the model of dissolving that you developed at the beginning of the lesson.